The Norfolk Tides today announced the return of a contest in which a local youth field will be renovated by Tides groundskeepers and front office staff. 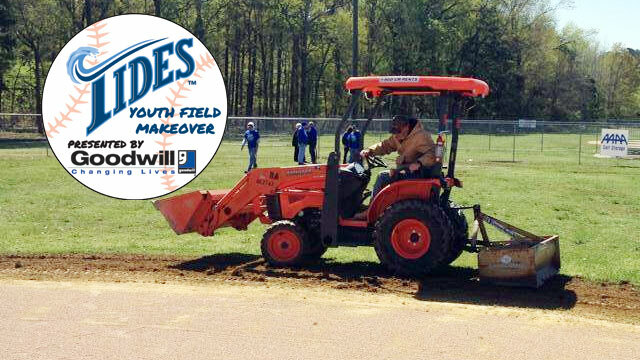 Proudly presented by Goodwill, this field makeover will include an upgrade to the playing surface and an improvement to existing dugouts, with the recipient of the makeover being determined by a fan vote on the Tides' Facebook page. "This project has become a yearly highlight for our entire front office staff" said Tides General Manager Joe Gregory. "We're excited to offer our resources to these worthy organizations, as they provide a home for children to learn the game of baseball while serving as an environment conducive to fitness and fun." Those interested in having the Tides makeover their facility should submit a picture of their field to Heather McKeating at HMckeating@norfolktides.com. Along with the photo, fans are asked to include a brief description of why their league should receive this enhancement. The deadline to submit this information is February 6, with online voting taking place on the Tides' Facebook page from February 16 to February 20. 2015 is the fourth year in which the Tides will be renovating a local youth field. Over the first three years of the program, the Tides have helped renovate six local fields - Ocean View Little League (Norfolk), Smithfield Recreation Association (Smithfield), Bennett's Creek Little League (Suffolk), Phoebus Little League (Hampton), Shore Little League (Nassawadox) and Cradock Little League (Portsmouth). "Goodwill is proud to support this amazing community giveback effort for a second consecutive year" said Danielle Cronin, Community Relations Manager for Goodwill. "As a nonprofit, we strengthen families and communities throughout Hampton Roads with our job training programs and career development services. The leadership and staff at Goodwill look forward to being a part of the field renovation - it's just one more way we can give back to our local community."